Last Saturday was Women’s Equality Day. It passed without much notice. In Philly there were only two events that I knew of, both sponsored by Vision 2020: The Toast to Tenacity to honor the suffragists who fought for the right to vote and the Women’s History Scavenger Hunt “uncovering little-known stories that give voice to women who made a difference.” There were commemorations on feminist websites, but Women's Equality Day has never really taken off as has International Women’s Day. 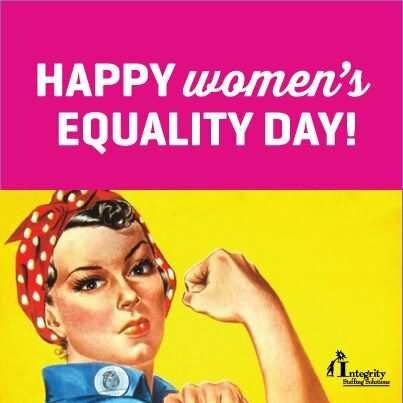 Women's Equality Day dates back to 1971 when Congress passed a resolution designating August 26 as Women’s Equality Day. The law, states that the president is "authorized and requested to issue a proclamation in commemoration of that day in 1920 on which the women in American were first guaranteed the right to vote." Every president since then has issued a proclamation, and even Donald Trump did so although according to to Jezebel columnist Stassa Edwards, it seemed like an afterthought: “In what really seems like a last minute decision, Donald Trump has declared Saturday Women’s Equality Day.” Edwards noted that the announcement was sent just before the end of the workday. The proclamation is hard to take seriously given Trump’s choice of a Supreme Court nominee who would strike down Roe v. Wade and his support for a Republican health care law which would defund Planned Parenthood. In general I tend to be an optimist and ( for the most part) believe the arc of history bends towards justice. Since the early 1970s, I have been confident the trajectory of the feminist movement has been upwards and onwards. Yes, there were some major setbacks in the 1980s, but feminists have successfully fought back and Roe v. Wade is still the law of the land. This is the first Women's Equality Day when I am no longer so confident. Even if a progressive Democrat is elected in 2020, so much damage will have been done, so much damage control we will have to do. I am clinging to the belief that although the Trump victory does represent a step backward on so many fronts, we will be back on track in 2020. I keep reminding my self that Hillary won the popular vote by a margin of three million. In the words of Michael Ignatieff: “A different outcome was only narrowly defeated…our present situation could have turned out very differently. We need to remember this if we are to recover the faith in ourselves that we need in order to shape the future in the direction of progressive ideals.” I’m trying to take his advice.